You are here: Home › Get the Free WRAP App! Shape every aspect of your life the way you want it to be? Gain freedom from troubling thoughts, behaviors, or patterns that repeat in your life? Feel empowered in making decisions about your life? Build a strong support network of people and resources to help you reach your goals? Using the WRAP App, you can develop your WRAP and carry it with you wherever you go. Based on the WRAP Workbook (revised 2018), the WRAP App walks you through the process of creating your personal WRAP. Use it on your own, with a friend or supporter, or in a WRAP group. 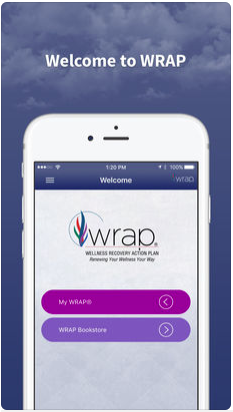 This app is designed to work alongside our WRAP books, other materials, and groups for a full understanding of what WRAP is and how you can implement it in your life. For more than 20 years, people around the world have used WRAP to support their goals and transform their lives. However you define “wellness” for your situation, WRAP can help you achieve it, step by step, your way, and on your terms. People who use WRAP say that it helps them feel better more often and improves the overall quality of their lives. Over time, they have found that it can easily be adapted to deal with any situation in their lives—anything from deep sadness to arthritis, from substance use to hearing voices, from panic attacks to diabetes to grieving the death of a loved one. In WRAP, we believe there are no limits to wellness and recovery. Read the WRAP app terms of service. Contact us about the WRAP app.